Stuck In The Buckosphere: Heat wave? Quite a hot weekend here in Central Ohio... Above is the radar loop from Saturday afternoon. A line of storms formed from the outflow boundary from the storms Friday night. From Cleveland down to Cincinnati. We hit a high of 90° on Saturday. For Sunday the rain was a little more scattered and less linear than Saturday. A few storms popped up again near and along I-71 just north of Columbus and BOY did it pour in those spots. Over four inches of rain in spots. Nothing at my place in Columbus. Sunday's high was 91° for Columbus. Today the forecasted high is 90° so it would be our first heatwave of the year. Still keeping a very close eye on the chance for rain later today. Here is a look at the Future Radar for 2:30 later this afternoon. It is looking fairly isolated, but there is plenty of energy there for a shower to quickly turn into a downpouring storm. I would keep an eye to the sky for sure. The same situation will play out through the entire workweek. Tuesday and Thursday some of the rain would be a little earlier with a better disturbance rolling through. Stay cool and relief will return by next weekend. It was quite the weekend. I was given a green shirt to wear in the Pride Parade on Saturday... but I decided to have a little fun. 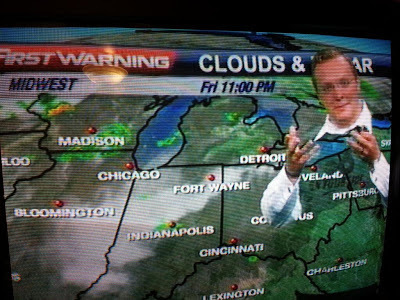 I wore the shirt during the 11PM newscast just to show what would happen. A lot of people thought I didn't know what I was doing and someone said it ended up on a Failblog website. Silly people, I did it on purpose for fun and to help promote the Pride Parade. It was quite comical. 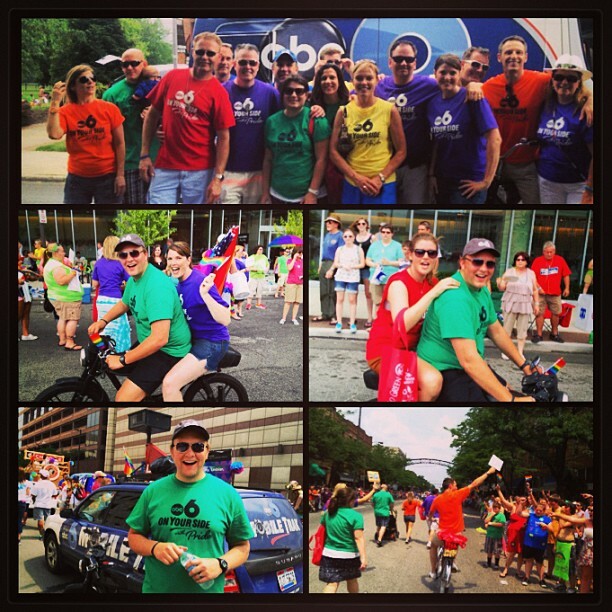 It was warm for the Pride parade and I rode my moped in the parade. People loved the fans that I was handing out. Quite hot indeed. 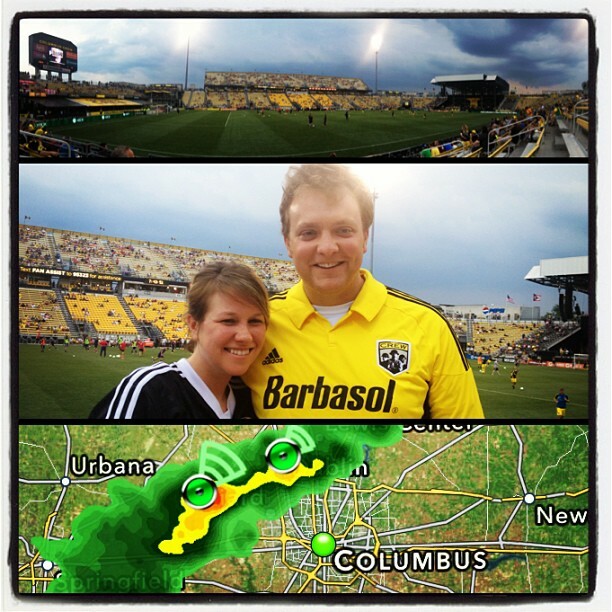 Saturday evening I went to the Columbus Crew game. It was my first Crew game and it was a lot of fun. Sadly, they didn't win, but we still enjoyed ourselves. At halftime they had paratroopers. 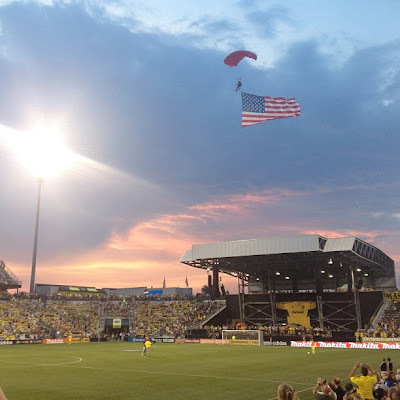 If you haven't been to Crew game yet... you should go. Lot of fun for the entire family. Sunday we hung out by the pool and just relaxed. It was really nice. Well, stay cool and have a good one!